TTi OnDemand Training | Technology Training, Inc.
TTi OnDemand Internet Training consists of complete courses video recorded during live presentations. With this option, individuals who cannot attend a live course or webinar can view the course materials and view pre-precorded lectures, complete with student/instructor discussions. Students can set their own schedule for learning. This option is ideal for international students! Thanks to well-thought-out placement of multiple cameras and microphones in the classroom, OnDemand students can see and hear not only the instructor's presentation, but questions from students, the instructor's answers, and general discussions in the classroom. The pre-recorded material is available for a 30-day subscription period, during which the student may view the material as many times as they wish. Separate short topics from courses may be purchased, by those who are only interested in specific areas and not the entire course. To purchase, view any course outline and click the buy now button next to the chapter(s) that interest you the most. 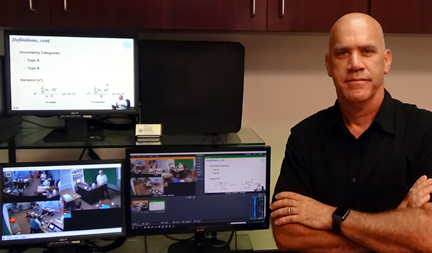 Mark Felton, TTi's Nevada Site Manager, is in charge of mixing the live seminar stream for later presentation as an on-demand course. Mixing and broadcasting multiple video sources is necessary to capture spontaneous gestures or equipment demonstrations. Here, TTi instructor Colin Ratcliffe explains resonance, while showing a video of how prolonged resonant excitation can shatter a wine glass.